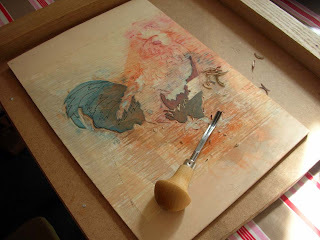 We have had a busy couple of weeks, but sadly without much time for printmaking! 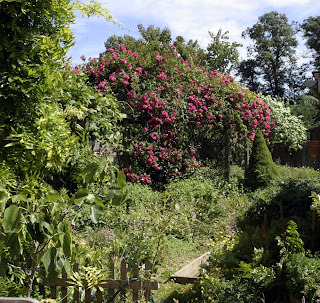 We spent the last two weekends at my parents house enjoying the sunshine and their big garden. Our own is looking splendid and everything is romping away. We did find time to set up our new shop on Dawanda - a European site for lovely handmade things (a bit like a European version of Etsy). 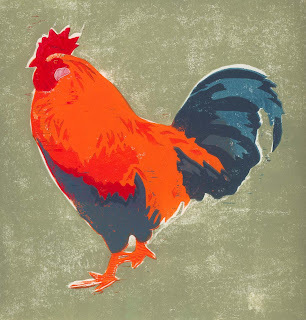 We haven't got all our prints listed in the shop yet, but hopefully they should all be there by the end of the week. The site is priced in Euros, and during Euro 2008 you can get an 11% discount in participating shops (including ours!) - the discount is applied automatically but is only available whilst matches are being played. We had a nice surprise this week when Jon's little Penguin print turned up on a cool crafty blog that I enjoy reading - thank you Lupin! We don't have the space at home for a proper studio so all our printmaking activities take place on our dining room table (helpfully covered by a wipe-clean striped oilcloth). 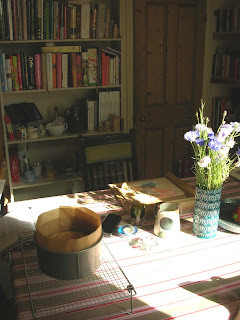 My favourite place to sit and carve is in the chair opposite the window, which gets the most sun. Everything gets moved to one sie of the table (or onto the floor) when its time to print, so we often end up having to eat our tea on our laps because the table is covered in wet prints and other printing paraphenalia. We've interviewed a fellow printmaker, Ellen Shipley, for the Prinsty (Printmakers of Etsy) team blog - read it here. 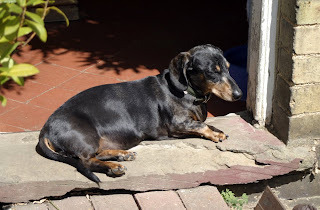 It has been very hot and sunny here for the past couple of days, which has meant lots of time in the garden tidying up and planting things out. It's all looking lovely and tidy out there now. 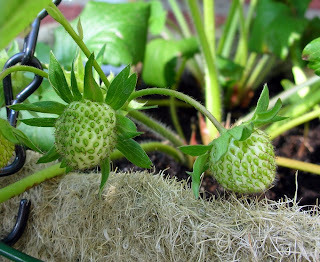 This is the first year that we have tried our hand at growing strawberries. These ones are in a hanging basket outside the back door, above the herbs. I've got all my fingers and toes crossed that they ripen!